News outlets often have an adversarial relationship with the government, a longstanding tension underscored most recently by the Obama administration’s pursuit of leaks to the Associated Press and Fox News Channel and the decisions of the Washington Post and the Guardian newspapers to publish National Security Agency documents. Nevertheless, it might come as a surprise to know that the government historically has provided some financial assistance to the news media. And according to a Pew Research Center survey, many leaders of the growing nonprofit news sector say they would welcome such assistance. A plurality of those surveyed, 39% of the nonprofit news outlets, said they favor “some form of government subsidies” to help fund organizations like theirs. More than a quarter (28%) said they were not sure. 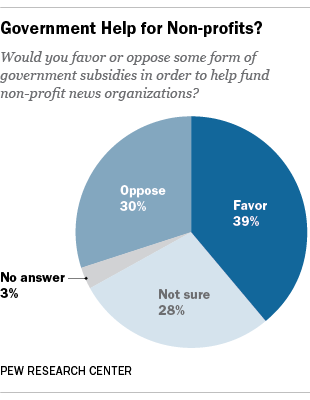 And another 30% said they oppose government subsidies to help finance nonprofit news outlets. Scores of nonprofit news organizations have popped up in recent years, often in an attempt to fill the journalistic gaps created by the constriction of legacy news outlets. Our study found that while many of the nonprofits seem to be doing well — and the majority of their leaders are optimistic — they face significant financial challenges as they work to secure their long-term futures. In fact, the notion that the government would subsidize the news business is not new. As far back as 1792, the federal government granted postal subsidies to news outlets, which for 178 years covered three-quarters of the costs of mailing periodicals, according to a 2010 report by the Annenberg School for Communication and Journalism at the University of Southern California. The subsidy remains in place but covers only 11% of mailing costs, primarily for magazines, the report said. Additional government help comes in the form of advertising and tax breaks. The Annenberg report found that federal and state tax breaks were worth more than $900 million annually to newspapers and magazines. Local, state and federal rules also mandate that governments and, in some cases, private businesses, buy newspaper ads to alert the public about impending action. Of course, nonprofit news outlets already receive government help by virtue of their tax status. Not only do they avoid tax bills themselves, their donors are permitted to deduct contributions. Further, a number of nonprofit news outlets are housed at or published by universities, some of which are state-run and almost all of which receive some form of government support.